As you know, we travel. A lot. And most of the time we have to pack quite a bit of extra gear comprised of our photography and videography equipment, so we’ve been working hard at minimizing the unnecessary clothing and luggage we take, especially when flying. When TripAdvisor asked if we’d be interested in partnering with them to review a series of new luggage pieces they’ve developed in conjunction with eBags, I was curious to find out how they might be different from what we already have in our arsenal (I mean collection), so I said yes. Of course, the husband said we didn’t need any more luggage, but knowing that every piece is unique and some are definitely better for certain trips than others, I thought we should try these out. And I’m really glad we did. TripAdvisor is the world’s largest travel site and features advice on all things travel with 435 million reviews and opinions from people who’ve actually been to over 6.8 million hotels and resorts, restaurants, and attractions around the globe. You can also book most of your travel on their site and be assured that you’re getting competitive rates since they check more than 200 sites to find the best pricing. I figured if anybody knows how to design efficient pieces of luggage it had to be them, especially when it was created with eBags. As part of their “Know better, Book better, and Go better” program, using the right luggage for travel is every bit as important as planning the trip. Hauling around a bunch of excess, awkward, and heavy luggage can ruin even the best vacation plans. And if you can fit your bag in the overhead bin and get off the plane and go – better yet! There’s nothing worse than waiting for your bags at the carousel when you could have already been on your way and off to enjoy your vacation! So how did their luggage compare? We’ve already been on two trips with these pieces. One adventure was to the Caribbean where we took two flights, a cab, and a boat to get there and then we had an unexpectedly extended road trip to Florida where we stayed at four different hotels. I love this piece. 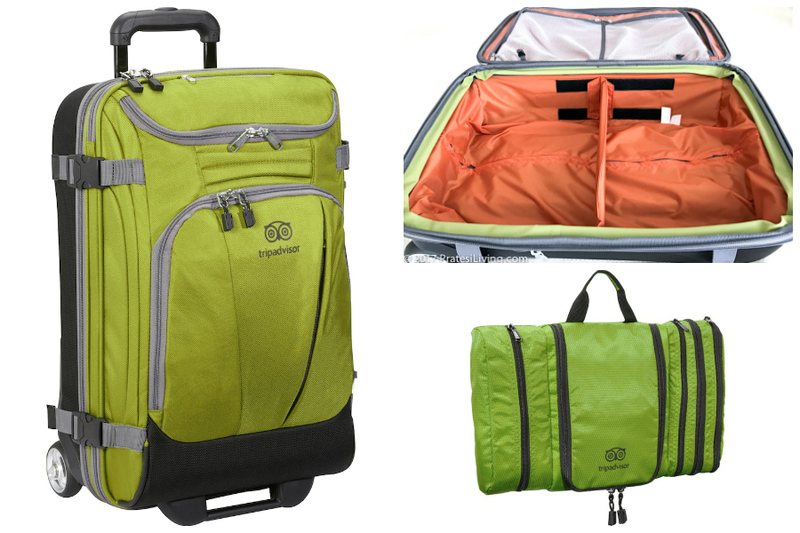 It’s lightweight and soft-sided, but has a hard case on the backside for durability. It is the perfect size to take on board a plane and store in the overhead bin. 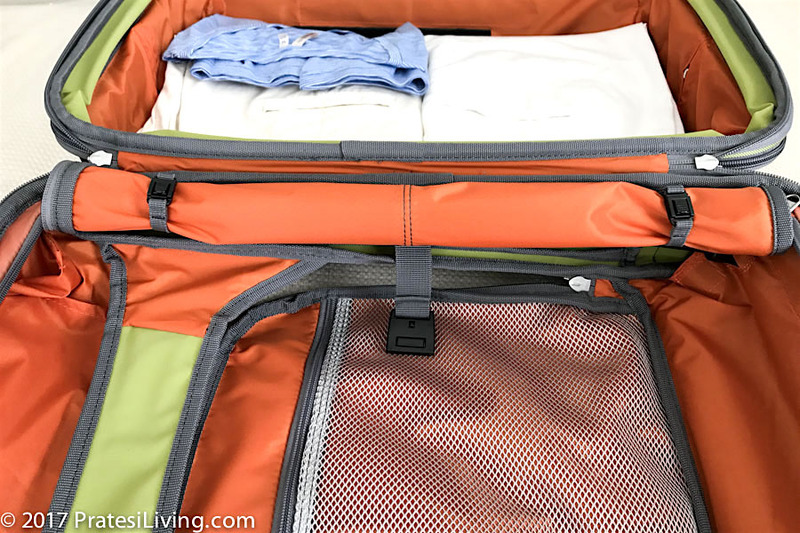 While a carry-on piece, it still has plenty of room with a zippered extension. It also comes with a divider insert and has very functional pockets on both the interior and exterior of the bag and several options for how to divide the space in the interior. I like the security of the bag in that it has lockable D-rings and straps that lock in place on both sides of the bag and is TSA approved. It was ideal for the 3-night excursion to the Caribbean, but really surprised me on the Florida road trip. I packed a mix of clothing due to variable temps and brought more than I thought I would need (just in case). As it turns out, we did stay twice the amount of time than we had originally planned, but I still came home with quite a bit of clean clothing, even after 1 ½ weeks on the road. Toiletry kits are always a challenge for me. Some of them don’t hold enough and if they do, they’re bulky. What I like about this kit is that it really is “slim,” so it fits neatly into your luggage or it could go into a large carry-on bag or purse. I was shocked at how much it held with all of the zippered compartments. I was able to get everything I needed into the kit and still had additional space leftover. I love the smart use of space where smaller items like lipsticks and eyeliners can go in the narrower zippered compartments, but things like pressed powder and quad eye shadow cases can fit in other larger spaces. 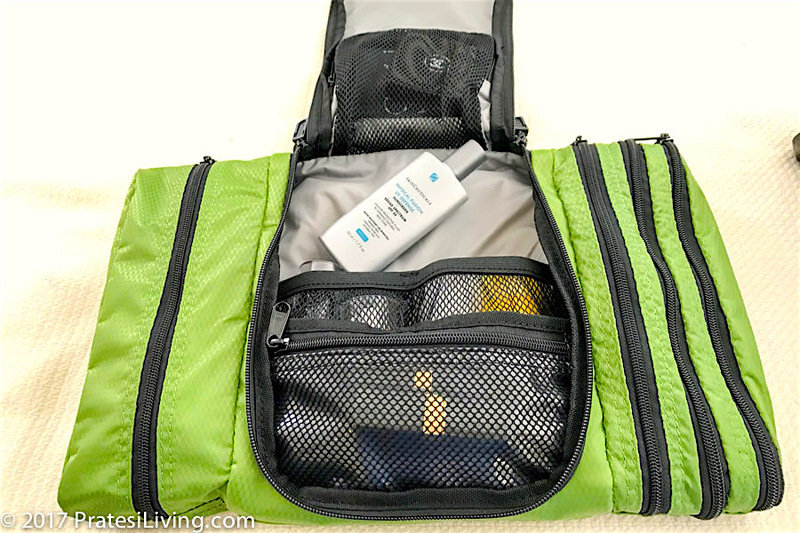 In addition, there are secure spots for liquids, lotion, or gels in a netted area and even an entire zippered section on the left lined with clear plastic, just in case something should leak. I still pack a few items in plastic bags, such as Q-tips, cotton pads, band-aids, and single use eye drops in one and liquids I don’t want all over my clothing, such as oily make-up removers and sunscreen, in another bag, but everything else fit easily in the kit and as mentioned above, I could have added more items. In addition, they also sent two TripAdvisor luggage tags: one that I could write my contact information on with a permanent marker and another TripAdvisor Interactive Luggage Tag, which I especially like. If your bag is lost and someone finds it, they can scan the QR code with an NFC enabled phone or go to the URL to locate your contact information. It securely fits on a zipper loop on the bag and is less bulky than luggage tags that hold business cards. Travel is a challenge sometimes, especially when it involves flying, so we’re all about simplifying the process. And that includes traveling with efficient and easy pieces of luggage. If you’re interested in purchasing any of these pieces, please use this link for a 25% discount on any piece from the TripAdvisor collection and 20% off of anything on the site. There’s also free shipping on orders over $49.00.